What this excerpt explains is that by focusing attention on the individual letters, as the Cunningham mesostics force our reader to do, we approach reading in a demilitarized, anti-exegetical manner. Language becomes a gift we give each other in the comunis, for no other purpose save that we can. To avoid enforcing the ego of the Author as arbiter of this gift exchange, Cage produces the Cunningham mesostics by way of experiment, as I noted briefly earlier. While I have endeavoured, in my introductory plateaus, to define the experimental poetic text for my project, Cage works throughout his career with a definition of the experiment that is uniquely his, and one that is thus an important function of reading his work. This work has been done, with some success, by critic William Brooks in his article “In re: ‘Experimental Music,’” where he puts Cage’s discussions of the artistic experiment in contrast to those of Cage’s contemporary composer, Lejaren Hiller. While Brooks discusses Cage’s music specifically, the definition of the experiment he produces is equally valuable to Cage’s poetic works. Cage and Hiller both publish articles working to define the artistic experiment in the late 1960s, and both do so in radically different ways. Brooks summarizes the difference in their respective definitions by way of a hypothetical anecdote, which I will summarize for you. Let’s say, then, that I am bicycling home from work, and notice a different route I could take. Taking this new route is my experiment. If I follow Hiller’s definition, I pose a hypothesis: this route will get me home faster. I take the route, and end up home much later than usual. My hypothesis is incorrect, but I learn about the new route’s value upon my arrival. If, instead, I follow Cage’s definition, and ask “what will I encounter if I take this alternate route?”, I cannot fail. I see a new coffee shop, a park, a market I would like to visit later. I do not gain any “use value,” I do not disprove a hypothesis, I merely make observations. Cage makes this much clear in his “History of Experimental Music in the United States” when he writes: “What is the nature of an experimental action? It is simply an action the outcome of which is not foreseen” (Silence 69). As fully experimental texts according to Cage’s definition, the Cunningham mesostics, products of chance operations, encourage readers to pay attention, to make observations about the language rather than to interpret a message (or, in an even more passive conception of the reading practice, to read and decode an encoded message). This turn in reading practice provoked by the Cunningham mesostics is even more striking once one learns that as experiments proper, the mesostics have failed. 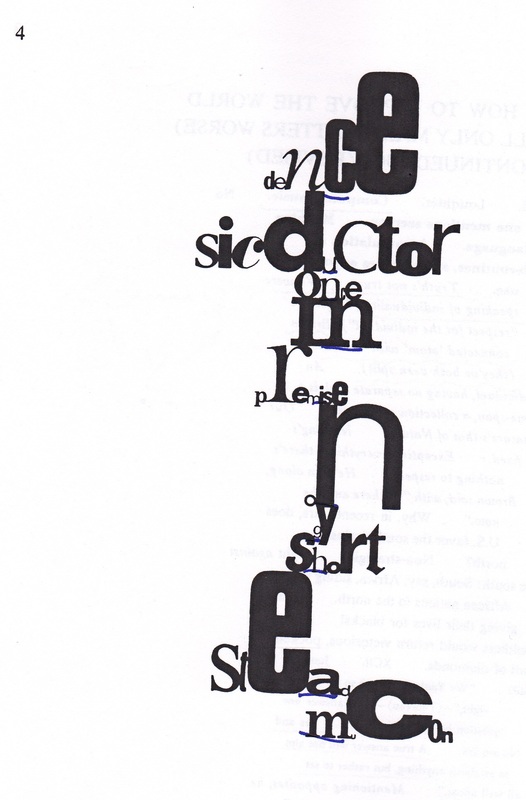 That is, Cage writes that printing the poems so that the various-sized letters would touch both horizontally and vertically would give the poem “a spine” and thus each poem could “resemble Cunningham himself, the dancer” (“Foreword” i). Despite the fact that, for Cage, this desired outcome did not come to fruition – that instead, the poems more closely resemble “waterfalls” or “ideograms” – he notes that “this is how they came to be made” (“Foreword” ii). Eschewing even those scientific connotations of the term experiment, Cage begins with a small semblance of a hypothesis, and then when even that fails him, what he uncovers is an even greater gift in its refusal to provide answers. Cage’s inclusion of the failed experiment in his publications, and his subsequent decisions to turn the poems into musical compositions, emphasized again not only this interest in observation, but additionally, and in this case more importantly, the egalitarian potentials of a lack of purpose, a composition in language that gestures beyond linguistic use value, that privileges noise well about semantic function, that expresses a deep discomfort with language. Cage’s discomfort with language, and with written language specifically, is well-documented in his work and the criticism surrounding it. One only needs to consider how frequently Cage references Norman O. Brown’s argument that “Syntax […] is the arrangement of the army. As we move away from it, we demilitarize language” (“Foreword” ii). In the Cunningham mesostics, this discomfort is represented most clearly by the nonce word “sicductor,” which appears as the second line of the very first mesostic. The first mesostic as it appears on the page, with my own pen marks. “Sic,” the Latin adverb meaning “so” or “thus” first appears as an English word meaning “intentionally so written” in the mid-1800s and is subsequently used, as we as academics are so used to seeing it, to denote an error reproduced in a quotation (Oxford English Dictionary). “Ductor,” in Latin “one who leads,” refers, in a printing press, “A roller which conveys the ink from the ink-fountain to the distributing-rollers” (OED). It is responsible in part, for getting the ink onto the page, and thus metonymically represents the materiality of language. So, “sicductor” suggests that, indeed, the ductor is sick, that the use of language in the Cunningham mesostics fails because Cage’s hypothesis seeks to represent, to literally present Cunningham’s body in the poems. “Sicductor,” then, also means that Cage’s work demonstrates an acute awareness of these errors. Additionally, following the original Latin meaning of “sic,” Cage’s work demonstrates a movement beyond the limitations of representation and exegesis, a “thus” from which Cage’s experimental work follows. The “sicductor” encourages Cage’s readers to look beyond interpretive reading, beyond use value. In this way, Cage’s work points us to Steve McCaffery’s scriptive adaptation of Georges Bataille’s theory of general economy. That is, the chance production of “sicductor” in the first mesostic sets the tone for the sequence as one of waste and excess. For McCaffrey, “meaning […] is staged as the telos and destination of the de-materialization of writing,” which is to say that “the physical act of speaking or writing must withdraw so that what has been said or written can appear meaningful” (204). In a sense, then, we can understand Cage’s prioritization of the physical act of the sequence’s production as a refusal to withdraw. Subsequently, the Cunningham mesostics do not produce meaning, do not satisfy a logical hypothesis, but rather, in their noise, they make observations about the problematic tension between semantic meaning and the materiality of language. This is really interesting, and I like the focus on attention and on reading “sicductor.” I have a question, though: you write that “by focusing attention on the individual letters, as the Cunningham mesostics force our reader to do, we approach reading in a demilitarized, anti-exegetical manner.” That makes sense. My question is, can we encounter these mesostics also as a performance or examination of the act of concatenating, of letters joining together into a series of communities/groups? Does attention have to focus on the individual letters as individual letters, or can we also talk about the letters in concert? Absolutely! And this is something I will have to make more clear in later revisions. In my vision of the Cunningham mesostics, this attention to the individual envisions a molecular (rather than molar or monadic) understanding of letters. To give each undivided attention, then, is to make note of the intricacies of linguistic connections. This avoids the individualism of more strident anarchists (and if we’re talking about linguistics, I might as well call out Chomsky here). And now I am also reminded of what Kurt Schwitters says in “The Artists’ Right to Self-Determination,” that experimental poetry “plays off values against values. One can also say ‘words against words'” and thus produces “a word-feeling” rather than a meaning (213). Cage’s comments (where? My memory fails, as usual, but he makes this point multiple times) that we are all centres and thus equally important centres among centres (which he sees as completely equalizing and anti-hierarchical), and that these centres are also “interpenetrated and interpenetrating,” (Cage’s words, I think) in a way similar to D&G’s rhizomatic interconnectedness (rather than an argument for Stirner-like individualism) might also be worthwhile when thinking through letters as individuals within concatenations (letters as both individual and connected, rather than one or the other). Absolutely. I think this is at play in Mac Low, too. In a few weeks when I do my entry on anarchism in Mac Low’s poetics, I will incorporate these issues. I’ll also look for these Cage references for further revisions of my Cage plateaus. “Ductor” is also an extinct species of prehistoric fish and its remains can now only be read through the trace of the fossil. What I love about Cage’s nonce words found through the mesostics for Merce is the plurality of virtual readings: on the one hand (the historian’s or etymologist’s) we have “sic” and “ductor”; on the other hand (the combinatorist’s) we have “sicductor” as its own entity; yet another, the different readings suggested by each font variation and script size, thus really pointing to the permutational quality of the mesostics; yet another, the “u” of “sicductor” that feeds into the overall mesostic spine of “cunningham” … the plurality of this seemingly simple nonsense word is really jarring. A punning poet may homophonically play and find a sick doctor; also where are these ducts? (ducts are like rhizomatic channels). Is this nonce-word also a conductor? or is it a “sic” duct” …. “or”?